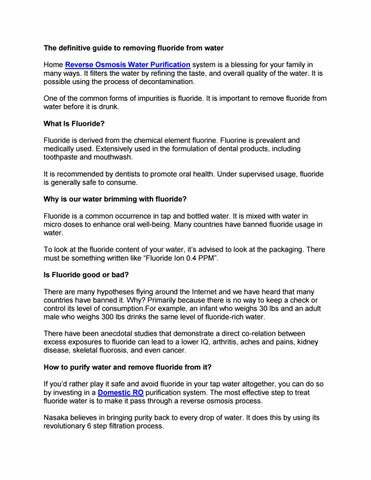 The definitive guide to removing fluoride from water Home Reverse Osmosis Water Purification system is a blessing for your family in many ways. It filters the water by refining the taste, and overall quality of the water. It is possible using the process of decontamination. One of the common forms of impurities is fluoride. It is important to remove fluoride from water before it is drunk. What Is Fluoride? Fluoride is derived from the chemical element fluorine. Fluorine is prevalent and medically used. Extensively used in the formulation of dental products, including toothpaste and mouthwash. It is recommended by dentists to promote oral health. Under supervised usage, fluoride is generally safe to consume. Why is our water brimming with fluoride? Fluoride is a common occurrence in tap and bottled water. It is mixed with water in micro doses to enhance oral well-being. Many countries have banned fluoride usage in water. To look at the fluoride content of your water, it’s advised to look at the packaging. There must be something written like “Fluoride Ion 0.4 PPM”. Is Fluoride good or bad? There are many hypotheses flying around the Internet and we have heard that many countries have banned it. Why? Primarily because there is no way to keep a check or control its level of consumption.For example, an infant who weighs 30 lbs and an adult male who weighs 300 lbs drinks the same level of fluoride-rich water. There have been anecdotal studies that demonstrate a direct co-relation between excess exposures to fluoride can lead to a lower IQ, arthritis, aches and pains, kidney disease, skeletal fluorosis, and even cancer. How to purify water and remove fluoride from it? If you’d rather play it safe and avoid fluoride in your tap water altogether, you can do so by investing in a Domestic RO purification system. The most effective step to treat fluoride water is to make it pass through a reverse osmosis process. 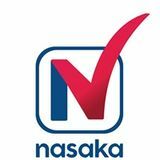 Nasaka believes in bringing purity back to every drop of water. It does this by using its revolutionary 6 step filtration process.